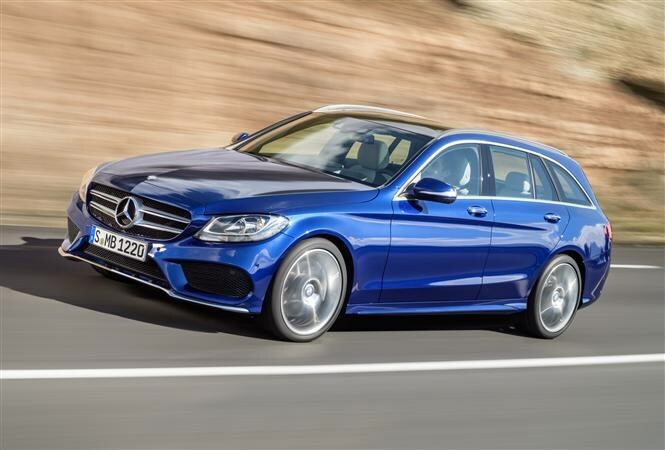 We’ve already driven the new Mercedes C-Class saloon, but now Mercedes has unveiled an Estate version which builds on the practicality, technology, efficiency and style of its predecessor. The firm’s hoping it builds on that car’s 33,000 UK sales figure too. This is not an out and out load-lugger; the press release buzzwords include multifaceted, modern and lifestyle throughout, which is reflected in the 490-litre load space behind the seats. That’s five litres larger than before, while the headline 1,510-litre number is up 10 litres over the C-Class Estate that came before. The rear seat now splits in a 40/20/40 configuration as standard, allowing you to juggle between passengers and cargo to your heart’s content. If you tick the right option boxes the backrests can be lowered electrically; a simple wave of your foot underneath the rear bumper will send the tailgate gliding skyward. It’s not all about cargo with the new C-Class estate though, as an 80mm increase in wheelbase from before liberates another 45mm of legroom for those on the rear bench. 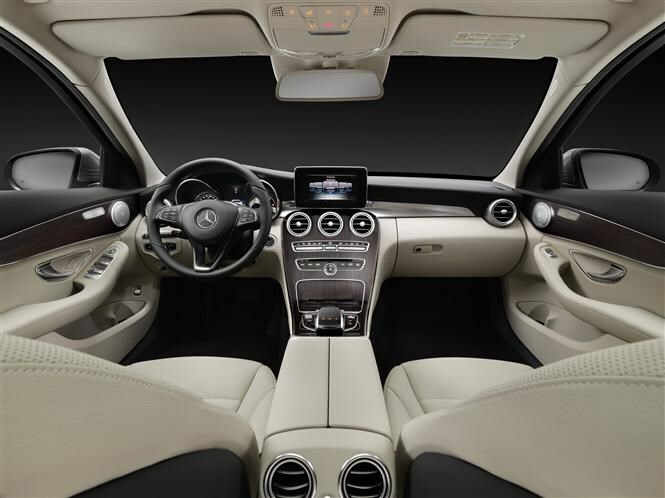 The rest of the cabin is lifted lock-stock from the new C-Class saloon, which is a very good thing indeed thanks to its flowing lines and innovative touchpad controller. Mimicking the familiar gestures of a smartphone to control the infotainment system the control surface is built into an elegant metal support on the centre console. Intuitive and quick to react, in the saloon it’s a real highlight of the segment. 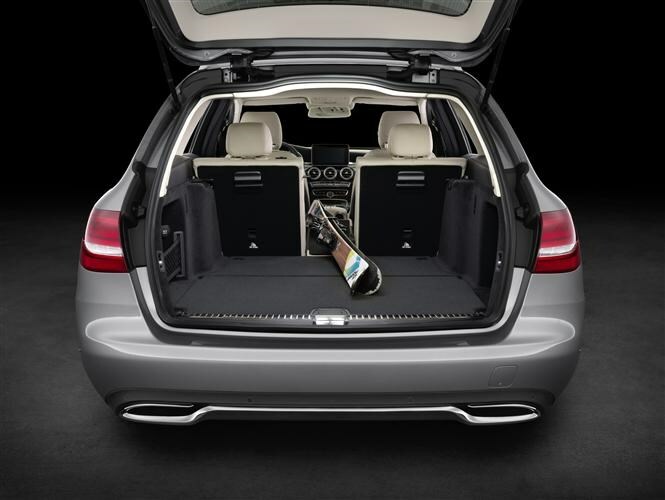 The impressive infotainment system is bolstered by the firm’s FrontBass sound system which places the low-frequency speakers in the chassis structure for improved sound quality, and for true audiophiles there’s an optional Burmester system. Passengers are just as well catered for by the navigation system as the driver, thanks to a drive show which displays journey images and information like on an airliner, while the GPS also recognises when the car is in a tunnel and changes the air recirculation function on the climate control accordingly. Like many of its rivals the C-Class Estate will also offer live traffic information and wi-fi hotspot for Internet usage when stationary. A new head-up display also features on the C-Class Estate and can project the vehicle’s speed, posted speed limits, navigation instructions and cruise control information onto the base of the windscreen. Almost all of the new assistance systems from the new S-Class make an appearance here as well, and the C-Class estate is fitted with Attention Assist to monitor driver drowsiness as well as Collision Prevention Assist Plus. The latter uses the Adaptive Brake System for autonomous braking at speeds between four and 65mph to help reduce or even avoid rear end impacts (up to 25mph) when the driver fails to respond to an unexpected object in front of them. The system is so advanced that with Distronic Plus, Steering Assist and Stop & Go Pilot it can actually follow vehicles in a tailback situation without any steering, throttle or brake input from the driver while maintaining its position within the lines of the road and a safe distance from the car in front. In the event it all goes wrong there are a multitude of airbags to take care of occupants, including one for the driver’s knees and an optimised window airbag. Active Parking Assist, which slots the C-Class Estate into a parking space itself is an option, as is Adaptive High Beam Plus which allows full beam headlights to remain on permanently by masking out any offending beam that would dazzle those being followed or driving towards the C-Class Estate. 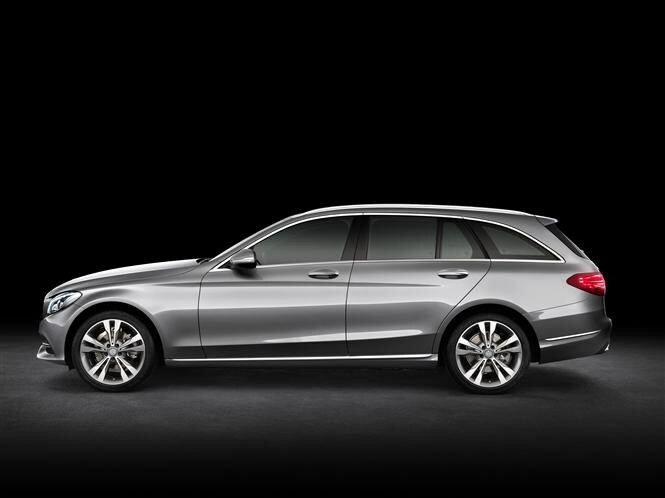 Thanks to extensive use of aluminium the new C-Class Estate weighs around 65Kg less than before, resulting in better performance from the three engines available at launch – two diesel and one petrol. The diesel options are the C220 BlueTEC with 167bhp, followed by the 201bhp C250 BlueTEC, while petrol-lovers will initially have to make do with the 181bhp C200. 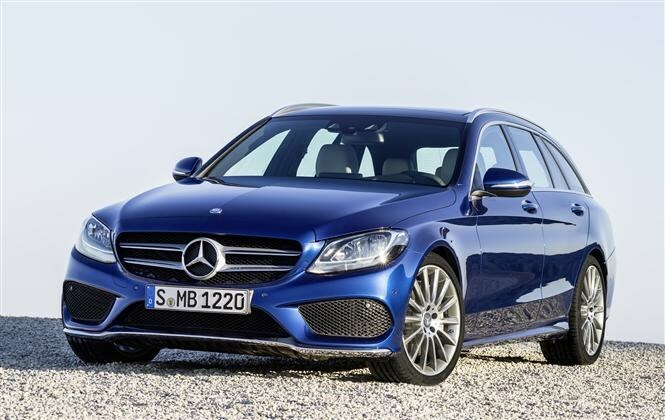 Expect more engines, including the C300 BlueTEC Hybrid to arrive in 2015. There’s an all-new suspension set-up to take advantage of the performance on offer too, with a four-link front axle and the choice of two steel-suspension set-ups (including a Sport version) as well Airmatic Air suspension with self-levelling all-round (rather than just on the rear). Drivers wanting even more personalisation can choose a driving mode that includes Comfort, Eco, Sport and Sport+ which will alter the steering, throttle and gearbox responses – an individual mode allows them to fine tune the parameters further. Regardless of which model you choose from – we’ll have SE, Sport and AMG trims here in the UK – you’ll enjoy the benefits of the firm’s Electromechanical Direct-Steer steering system which offers speed-sensitive assistance and a ratio that changes as you add lock. The new Mercedes C-Class Estate will arrive in the UK in September, priced around £1,200 more than the equivalent saloon model at approximately £30,500 for the C220 BlueTEC and £28,000 for the C200 Petrol. We’ll be driving it soon so check back before then for a full Parkers Mercedes C-Class Estate review.